A stream of solar wind flowing from the indicated coronal hole could reach Earth on Sept. 24. Credit: SDO/AIA. Spaceweather.com is now posting daily satellite images of noctilucent clouds (NLCs), which hover over Earth's poles at the edge of space. The data come from NASA's AIM spacecraft. The north polar "daisy" pictured below is a composite of near-realtime images from AIM assembled by researchers at the University of Colorado's Laboratory for Atmospheric and Space Physics (LASP). They came from outer space--and you can have one! Genuine meteorites are now on sale in the Space Weather Store. QUIET SUN: Today is another day that seems more like Solar Min than Solar Max. All of the sunspots on the Earthside of the sun are quiet, and solar activity is low. NOAA forecasters estimate a slim 5% chance of M-class flares on Sept. 24th. Solar flare alerts: text, voice. "Early on the evening of September 23th, I noticed these strong magnetic and induced earth current variations on my instruments," says Stammes. "At the same time, strong auroras appeared outside our center. The Northern Lights were a nice surprise for our guests." The display might be related to the approach of a solar wind stream Earth is entering now. Measurements from the ACE spacecraft indicate that the solar wind is quickening, and this is causing magnetic disturbances around the poles on Sept. 24th. Arctic sky watchers should remain alert for auroras. Aurora alerts: text, voice. Photo details: 17" CDK with FLI-PL6303e camera. LRGB. L: 5x3mins. RGB: 1x2mins. Sun -18 to -14deg. 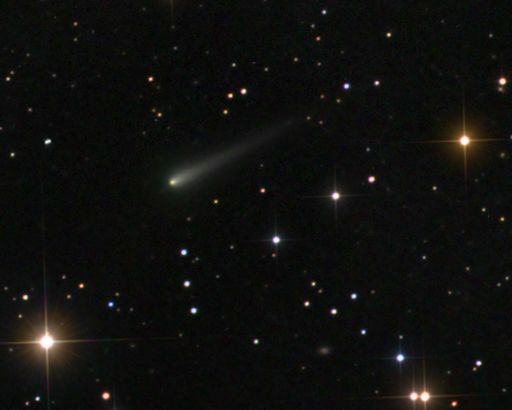 At the moment, Comet ISON is about as bright as a 14th magnitude star, which puts it one or two magnitudes dimmer than forecasts. Nevertheless, according to several experts speaking in a NASA video, Comet ISON is still on track to become an impressive sungrazer. John Bortle predicts ISON will rival Venus during the hours leading up to its closest approach to the Sun in November, while Matthew Knight notes that Comet ISON is brighter than Comet Lovejoy was at the same distance from the sun in 2011. As many readers remember, Comet Lovejoy went on to become a spectacular naked-eye object. Comet ISON might do the same. On September 24, 2013 there were potentially hazardous asteroids.